Which Are Sydney's Top Schools? The HSC results for 2016 have once again been fuelling the government vs. non-government vs. selective schools debate. This year it would seem, once again, that selective schools have come out on top, but not without some impressive moves up the ladder by some outliers. FOR 2017 RESULTS PLEASE CLICK HERE! The school ranked number 1 in NSW for the 21st year in a row was selective school James Ruse Agricultural College. They achieved first place in English (Advanced), Extension 1 and Extension 2, as well as first in Mathematics Extension 1 and Extension 2. It seemed that selective schools shone in Mathematics (pictured below) in particular, with North Sydney Boys, Baulkham Hills, Normanhurst Boys, North Sydney Girls, Sydney Boys, N. Beaches (Manly) and Fort Street all dominating the high-level maths courses. Kilara was the only government school to make the top 20 merit list. For higher level english (pictured below), it seemed non-government schools dominated, including Reddam, Kincoppal, SHORE, Kambala, Brigidine Randwick, Moriah, and more. 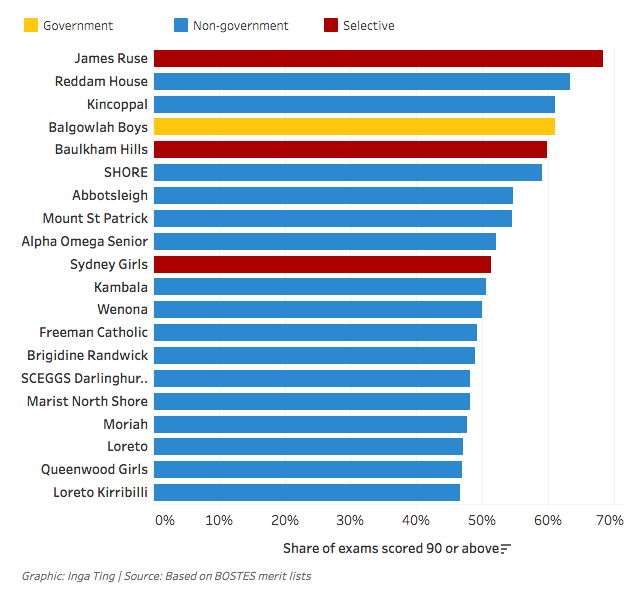 Government school Balgowlah Boys was the only of its kind to make the merit list, coming an impressive equal third to beat out their selective school neighbours Northern Beaches Secondary College in Manly. According to The Daily Telegraph, wealthy private schools like Trinity Grammar were outperformed by government schools including Heltenham Girls, Cherrybrook Technology and Killara. Despite charging students $31,000 during their exam year, Trinity was even beat out by the likes of Newtown Performing Arts School who made a move into the top 100 in 2016. In terms of first-in-state awards for individual students, government schools picked up 34 awards, whilst non government picked up 40. 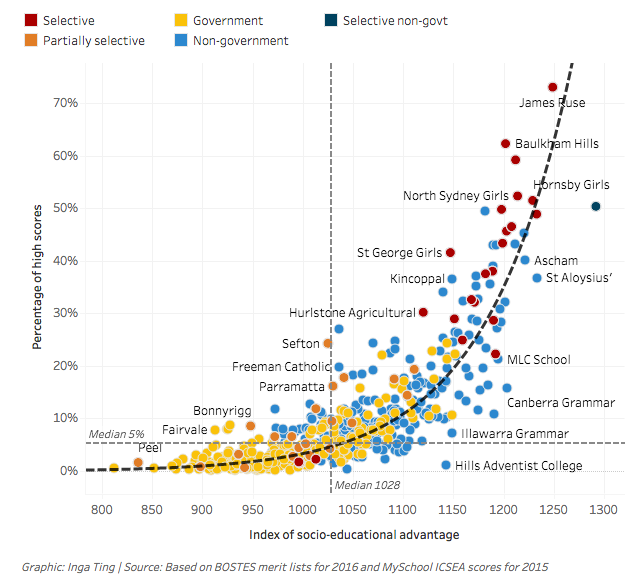 Although the inequality gap between different schools and HSC performance is an issue that cannot be ignored, there were some shining stars in the most economically disadvantaged regions of NSW. Typically, the best predictor of HSC performance is unfortunately the socio-economic status of its students, but that didn’t seem to stop many of them. Schools such as Coonabarabran High, Canley Vale, Inverell, Bonnyrigg and Fairvale are part of the state’s most disadvantaged 25%, however outperformed schools in the top 25% according to the Sydney Morning Herald. Adrian Escho, from Bonnyrigg attended Fairvale, and has come out with an ATAR of 98.6. “I don’t even have any words, I’m so happy,” Adriana Esho told the SMH.